A lathe is a machine that rotates a workpiece on a spindle to cut away excess material, using cutting tools and drill bits with different diameters that are applied to the workpiece to produce a symmetrical object. These machines are capable of producing a variety of shapes, cuts, and details on a rotating work part. On a CNC lathe machine, a machinist can program the machine to make difficult cuts on tough materials and produce quality pieces at a high rate. 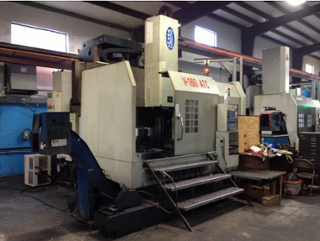 CNC lathes come in either vertical or horizontal forms. In this article, we will discuss the differences and uses for the two. CNC horizontal lathe machining is performed using horizontally-configured lathes. These machines rotate a workpiece cylindrically, like a rotisserie chicken, while tooling shapes the piece by cutting away excess materials. Because the workpieces have to lie vertically, horizontal lathe machines tend to have a larger footprint or amount of total space that they take up, making them best reserved for use on smaller or midsize workpieces. Similarly, because the chuck on these machines hold the work piece vertically, against the natural gravitational downward pull of the object, these machines are best used for lighter materials, or else you run the risk of damaging the chuck. This information is particularly important to keep in mind if you are buying a used CNC lathe machine and be sure to ask your dealer about the machine’s past work history. On a CNC vertical lathe, the workpiece rotates upright, like a pottery wheel, allowing the spindle to cut at hard to reach angles. This gives vertical lathes a naturally smaller footprint than horizontal lathes, making them ideal for manufacturing super large and heavy workpieces, including those that have to be loaded with a crane. The smaller footprint also allows for the option of dual-spindles to work on a piece without compromising additional floor space, and makes them a good choice for pinch turning operations. Additionally, gravity works in favor of the machine’s vertical design, keeping the workpiece stable throughout the machining process, which allows for steady spindle movements and more accurate cutting. Taking these advantages in mind, it's important to note that vertical lathes tend to run a bit more expensive than their horizontal counterparts. Regardless of which type of lathe machine you get, make sure that it has high-quality clamps. The clamps hold the workpiece steady while the tooling removes excess materials. Low-quality clamps have a tendency to shift around while work is being done, which can lead to inaccurate measurements. Also, if shopping for a used lathe machine, you will need to enquire about the machine’s tolerance, that way you will not have to perform multiple finishing operations to complete a piece. Both types of lathes have different advantages and disadvantages. For example, horizontal lathes are typically less expensive than vertical lathes, but are better suited for working on smaller workpieces. Vertical lathes typically cost more than horizontal lathes, but are more space efficient and can work on larger pieces. The best machine for you will depend on your business and manufacturing needs. Because of their multiple uses and complex features, it is best to speak to an expert before committing to a particular lathe machine. The sales representatives at Machinery Marketing International have years of experience in selling lathes for a variety of manufacturing businesses. Click below to view MMI's smart site to compare and find the best CNC lathe for you.